Martina Floria, an Imperial sorceress, is a Wizard of the Mages Guild who offers Master Training in Illusion and Recharging services at the Arcane University. Martina is a real night owl. Starting at 10pm and through the whole night, she can be found pacing restlessly around the ground floor of the University's Chironasium, offering her services the whole time. In the early afternoon, at 2pm, she finally heads to bed on the second floor for eight hours of sleep. She wears the standard mage's robe, but no shoes. She also carries the key to the Enchanting Center and a sizable amount of gold. She doesn't wield any weapons, relying instead on a set of leveled spells from all of the magical schools but Mysticism. The first time you meet her, she will introduce herself and her services: "Martina Floria, Master Enchanter for the Mages Guild. Welcome to the Chironasium. Enchanting, isn't it?" Unlike most of her colleagues at the Arcane University, she actually likes the city: "I like cities, and this is the biggest and the best. All races, cultures, cuisines, crafts... the City has them all." If you have started her related quest, she will make you an offer: "Hmm. A trade is in order, don't you think? My services in exchange for... oh, let's say ten Welkynd Stones. I'd say that's fair. Let me know when you have them." And when you bring her the stones, she will be delighted: "Ah, ten Welkynd Stones. Most useful for my research. Thank you. And now, I am at your service." If you ask her about your mage's staff in the related quest, she will direct you to Delmar: "Delmar handles all staff enchantments. You'll need to speak to him about it." 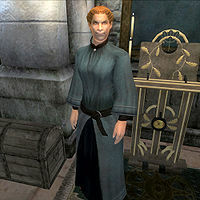 Even other talented illusionists acknowledge Martina's skill: the heads of both the Anvil and Bravil guild halls will refer you to her once you reach an illusion skill of 70. Kud-Ei in Bravil tells you that "Martina Floria at the Arcane University has truly mastered Illusion spells. You should speak with her about training further." and Anvil's Carahil admits that "Martina Floria at the Arcane University has a much better mastery of Illusion spells than I. You should travel there and speak with her." Illusion Training: Supply a master illusionist with Welkynd Stones to receive her training. This page was last modified on 31 January 2018, at 23:42.